Heat oven to 400°F. In small bowl, mix bread crumbs, salt and pepper. Add parsley, lemon peel and cheese; toss well. In 3-quart saucepan, heat 4 cups water and 1 teaspoon salt to boiling. Add green beans. Heat to boiling; reduce heat. Simmer 5 to 6 minutes or until crisp-tender; drain. Butter shallow baking dish. Toss cooled green beans with 2 tablespoons olive oil; sprinkle with salt and pepper. Divide green beans into 4 equal bundles. On work surface, arrange 2 slices of the prosciutto so they slightly overlap each other. 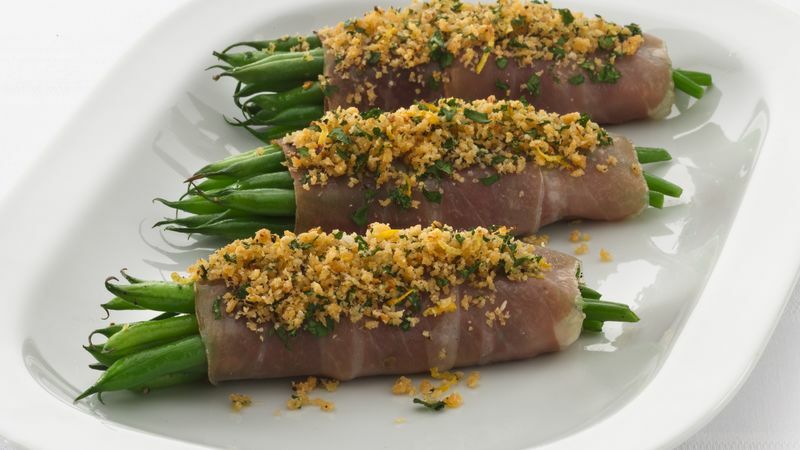 Top with 1 bundle of green beans and roll up carefully in prosciutto. Place in baking dish. Repeat with remaining prosciutto and green beans. Flatten tops of bundles slightly; sprinkle with topping. Bake about 10 minutes or until thoroughly heated and crisp. Serve immediately. "Buy yourself something beautiful. When you present your meal in interesting and unique serving pieces that reflect your own interest and personality, you make even the quietest evening at home feel like a special occasion. Don’t worry about matching; just collect things that you love, and use them every chance you get."